SEATTLE — Robinson Cano and Nelson Cruz form one of the most dangerous 3-4 combos in any major league lineup. They delivered as advertised Friday night, leading the way in making life miserable for A’s starter Raul Alcantara. The rookie gave up four home runs in just two-plus innings as Oakland was dispatched easily, 5-1, at Safeco Field. Cano homered twice off Alcantara, including going back-to-back with Cruz in the third. Nori Aoki also went deep as the Mariners moved to within one game of Toronto for the American League’s second Wild Card spot with two to play. Alcantara (1-3) had shown promise in three starts since a shaky big league debut, but he paid for leaving too many pitches over the fat part of the plate, and Seattle made him pay. 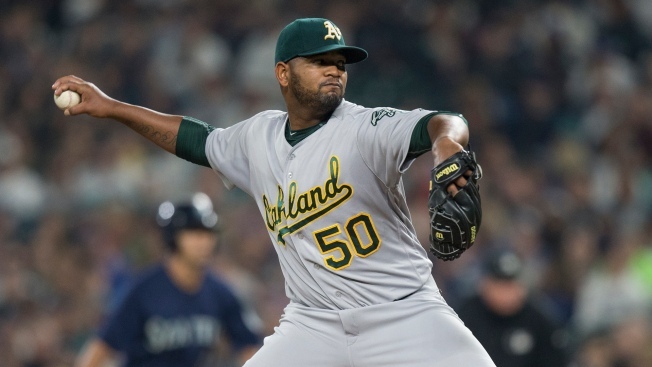 Conversely, the A’s couldn’t generate anything against right-hander Taijuan Walker and three relievers. They mustered just **** hits all night, with Ryon Healy’s home run in the sixth their lone offensive highlight. The A’s have lost five in a row and 10 of their last 11. Cano connected for a two-run shot off Alcantara in the first, but the rookie did well to escape further damage after putting runners on second and third with one out. But Aoki hit an 0-1 pitch deep to right for a 3-0 lead. Then Cano and Cruz both went deep to center in the third. Jake Smolinski made a leaping effort on Cruz’s drive and nearly made a highlight reel grab over the wall, but the ball just evaded his glove. Alcantara surrendered five runs on seven hits and was relieved by Zach Neal after Kyle Seager’s double in the third. What an effort from Neal, who was the A’s MVP on an otherwise dreary night. He continued to excel in a long relief role, retiring all 15 batters he faced in five perfect innings. Evan Scribner, the former Athletic, threw a scoreless inning for Seattle and has been very effective since coming off the disabled list. Healy connected for his 13th homer, a drive to right-center. That was it for the A’s, who didn’t put up much of a fight with the bat in their hands. The Mariners committed the game’s only error. The announced turnout was 24,088. Game three of this season-ending four-game set begins at 6:10 p.m. Saturday, with Jharel Cotton (2-0, 1.44) matching up against Hisashi Iwakuma (16-12, 3.96).